CITIZENFOUR is a real life thriller, unfolding by the minute, giving audiences unprecedented access to filmmaker Laura Poitras and journalist Glenn Greenwald's encounters with Edward Snowden in Hong Kong, as he hands over classified documents providing evidence of mass indiscriminate and illegal invasions of privacy by the National Security Agency (NSA). 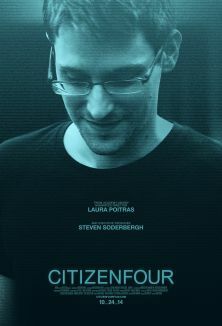 Poitras had already been working on a film about surveillance for two years when Snowden contacted her, using the name "CITIZENFOUR," in January 2013. He reached out to her because he knew she had long been a target of government surveillance, stopped at airports numerous times, and had refused to be intimidated. When Snowden revealed he was a high-level analyst driven to expose the massive surveillance of Americans by the NSA, Poitras persuaded him to let her film. CITIZENFOUR places you in the room with Poitras, Greenwald, and Snowden as they attempt to manage the media storm raging outside, forced to make quick decisions that will impact their lives and all of those around them. CITIZENFOUR not only shows you the dangers of governmental surveillance-it makes you feel them. After seeing the film, you will never think the same way about your phone, email, credit card, web browser, or profile, ever again. Laura Poitras is a documentary filmmaker, journalist, and artist. Her films have premiered at festivals worldwide and, along with her journalism, have received multiple honors including a Peabody Award, as well as Academy Award ® and Emmy nominations. Along with Glenn Greenwald and Jeremy Scahill, she is co-founder of The Intercept. For more information on the filmmaker, cast and production visit the CITIZENFOUR website. Professor Heather Brooke, City University London, is an award-winning journalist whose investigative journalism and legal action against the British Parliament for disclosure of MPs' expenses was the catalyst of the expenses scandal of 2009 and led to the biggest clear-out of politicians in decades and the first forced resignation of the Speaker of the House in 300 years. Heather will be joined in her introduction of the film by Gus Hosein, director of Privacy International. PI fights for privacy rights across the world and is taking legal action against British intelligence services in light of the Snowden disclosure. Gus is the director of Privacy International and has worked at the intersection of technology and human rights for over fifteen years. He has advised the UN Special Rapporteur on Terrorism and Human Rights, and has advised a number of other international organisations. He holds a B.Math from the University of Waterloo in Canada and a PhD from the London School of Economics.